saddle of land. The north part of each side gets the most rain, while the south and east portions get under 10 inches annually. sections of these two virtual islands are dry because they are in the rain shadow of the volcanos. This red sand beach is just outside of Hana and is rather difficult to get to at high tide, especially in the dark before sunrise. The old path was washed away by a landslide and the waves at high tide make it difficult to run across the beaches between waves. But high tide is needed for the waves to wash over the rocks you see here. I moved around until I positioned the sun in the corner to act as a spotlight on the rest of the scene. The rocks really are that red and the red sand to the left is even more red. This black sand beach near Hana is extremely scenic but very difficult to photograph. 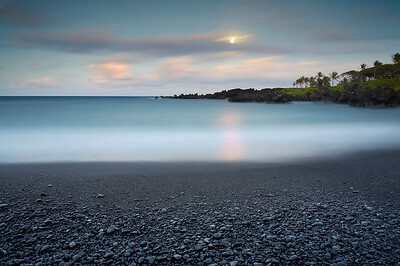 The contrast between the black sand and the rest of the scene is often too much for the camera to handle and most images turn out too black and too bright at the same time. But a careful use of ND grad filters combined with a little remaining daylight after sunset working with the moonlight allowed the entire scene to be exposed properly. It was a warm and beautiful evening to be out with the camera. Waianapanapa means, 'glistening waters' and they are not kidding! 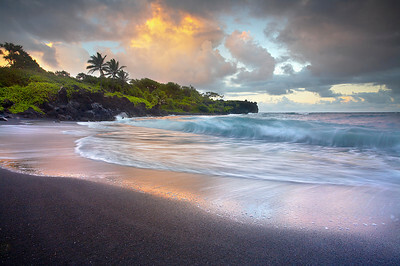 There are many ways to photograph this black sand beach near Hana, Maui. But it takes a while to see the opportunities. 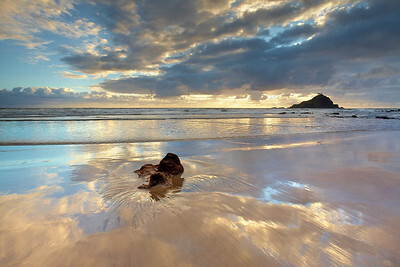 In this moment, the sand was briefly wet and reflected the last glowing light from the clouds above. It took a while for a wave to break just when the sand was glowing. I tried for 5 minutes before the timing was right. A few minutes later the light was gone for the day. 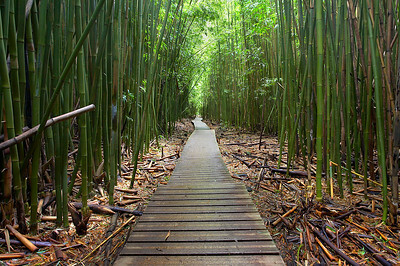 This path goes 2 miles along the stream that forms the seven sacred pools of Oheo Gulch. While there are more than seven pools and they are not sacred, they are spectacular to see and swim. Along the way to the 400+ vertical foot Waimoku falls, there are many bridges, forests and canyons. And this bamboo forest is one of the highlights of the trip. It is dark, warm and humid here. It feels like you are in a hothouse with no wind at all. The air is this with oxygen. I did not want to leave so I spent some extra time here trying to get this photograph. I will always remember this place better now that I have this photo. 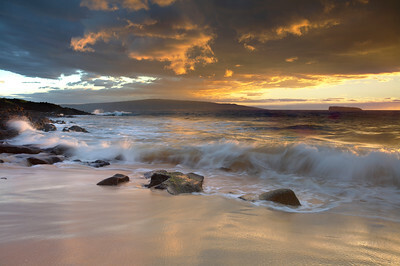 It was a brief but spectacular light show on Little Beach as I looked out towards Molokini and Kaho`olawe islands. I enjoy photography in Hawaii because the constant trade winds almost guarantee clouds on one side of the island or the other. So about an hour before sunset, I study the clouds and head out where they are the best. This beach is just over a spit of lava from Big Beach and offers nice views of the other side of maui and the island of Lanai too. The islet of Molokini to the right is shaped like a crescent moon with excellent diving and snorkeling on the inside. 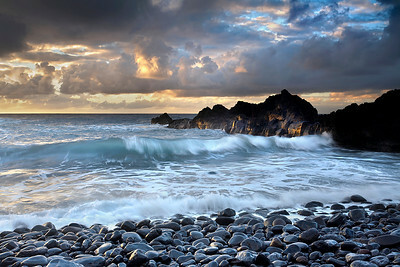 This black cobblestone beach near Hana, Maui is right next to what is locally called the Venus Pool. This is a really spectacular place with a pool right behind the beach. Most people photograph the pool, but the cobblestones were too much to resist! I did get a nice one of the pool which I may upload later. The black rocks reflect virtually no light for the camera unless they are wet and shiny. So I found a nice reflective spot and waited for the light on the rock and the cobblestones. Once that happened, I waited for a nicely formed wave to break. 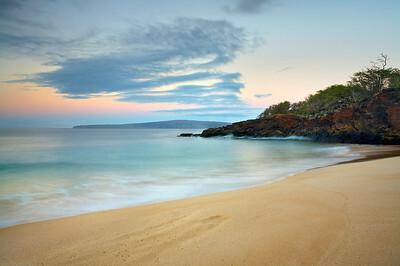 Kaanapali is Maui's most popular beach with many large hotel complexes lining its shoreline. Flocks of people come down to see the spectacular sunsets that seem to happen nearly every day. It was difficult to get a wide view from the island of Lanai on the left, past Molokai in the clouds to black rock on the left, and still have no people in the image. But when I got down into the water, I was able exclude the people and get close to the sand at just the moment it turned gold in between each wave. Sand looks it's best just after a large wave sweeps the entire beach clean and begins to dry up. Smaller waves create patterns that often do not look as good. 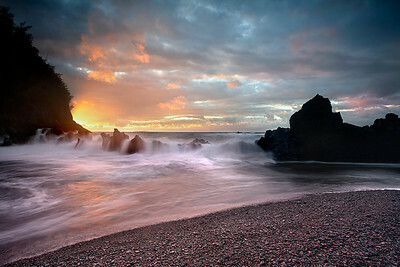 This beach is about 5 minutes past Hana as you drive East. It is one of the few golden-sand beaches on this side of the island because there was more recent volcanic activity here. I was intrigued about how the little rock on Koki beach was like a miniature version of Alau island in the distance. I waited for the best moment where the sand was at it's most reflective and the incoming water made pleasing patterns in the distance. 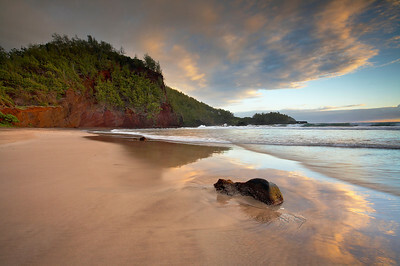 This beach is about 3 miles south of Hana, Maui. The side closest to the red cliff has a bit of red sand, with a little red mixed into the coral based sand on the rest of the beach. I walked up and down this beach before sunrise several times before spotting the symmetry between the cloud and the reflection in the periodically wet sand. Then I waited for a while until the sand was wet again. Two minutes later the light was bright and harsh and the show was over. I believe that Ophah Winfrey owns this hill and the land behind it and to the right. You can barely make out a striking sea arch on the right side. It can not be accessed without crossing the land, at least from this side. 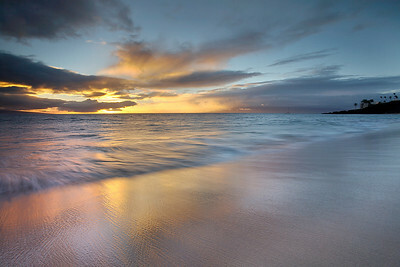 Just before sunrise on Big Beach (Oneloa Beach), the dark shadow of Haleakala hung on the horizon, accentuating the golden pre-dawn light in the sky. In the distance, Kaho`olawe was still in the shadow. I used F22 to show the fine detail on the beach including the holes left by burrowing crabs. That made the exposure about 5 seconds, so I waited for the waves to calm down, in order to avoid the messy cottony look that a 5 second exposure does to an image when big waves are present. The smooth water helps to convey the peacefulness of being here for this sunrise.